With the advent of iron - and later steel - the efficiency of carving marble and stones of similar hardness improved, and the most common types of hammers and chisels for carving by hand have since remained almost unchanged. There have been some improvements such as tungsten carbide inserts for chisel tips that allow carving of harder stones like granite, but high carbon tool steel is still preferred by many carvers for working in more responsive marble and similar types of stone. As the relative hardness of a stone increases, generally the brittleness of the stone becomes greater as well. Where the action of carving softer stones might be likened to using the wedging action of the cutting edge of the chisel to pry the waste off the body of the stone, the carving of harder stones could be likened to a controlled fracture. Aside from the shape of the striking end, the Hammer Head chisel differs from the Mallet Headed type in that the cutting edge of the tool only is hardened and tempered, while the shank of the tool is left unhardened. 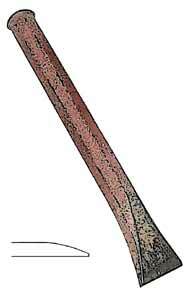 This is to allow the shank a certain amount of resilience when working hard stone under the blows of a hardened steel Hammer - i.e., the shank will bend rather than break . . . when between the rock and the hard place! 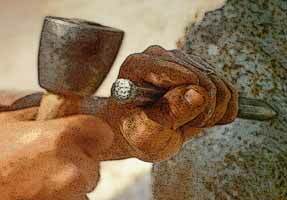 When a softer blow is required, such as when doing detail or finishing work, many carvers prefer to use the soft iron 'lump' Hammer. 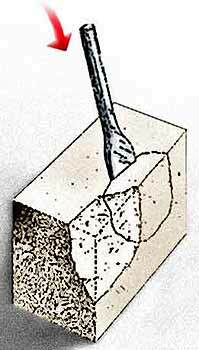 The impact of the soft iron hammer when striking the harder steel chisel deforms the hammer head slightly with each blow, but affords the carver somewhat more control. Hammers suitable for carving are available in a number of sizes and styles, and each type has its unique advantages in the process. Perhaps the single most important factor the carver must consider in reaching for a hammer is to use match the weight to the needs of the work. For general carving a one-and-a-half to two-pound hammer is ideal. Though easier to swing repeatedly, the light one-pound hammer needs to strike two or three hard blows to remove the same amount of material as one normal blow from a two-pound hammer. Smaller hammers are useful when doing finishing details because of the extra degree of control they afford. Though more fatiguing to use, heavier hammers are needed when working harder stones, or during roughing-out stages where sheer power is more important than fine control. To achieve this controlled fracture requires a sharp, hard blow. The steel Hammer Headed Chisel is made to transfer this sharp, hard blow from a hardened steel Hammer, such as any of the examples of hammers shown at right. The basic types of chisel used for stone carving are shown at right. The tools are generally used in sequence as pictured, beginning from the left. Many sculptors might use chisels like those above for all their work when stonecarving, managing quite well with the wide selection available in those basic types of chisel. However, for those sculptors working in large blocks of stone or who often get stone cut-to-order for commission work there are a couple of additional types of chisel that might be used. During the initial stages of working on a dimensionally-cut block sometimes very large amounts of waste need to be removed before carving, as such, begins. The Pitching Tool - aka, the Pitcher or Hand Set - is also used to remove a great deal of waste material at the initial stages of carving, but only if the carving block has flat-sawn faces. The 'working-edge' of the Pitching Tool is a broad flat face that usually is ground to an angle just slightly-off the perpendicular. In use, the most forward of the two crisp almost-right-angle edges is placed on the flat-sawn surface of the workpiece. The Pitching Tool is placed in proximity to the edge of the workpiece to be 'pitched' and is struck with a forceful blow of the steel hammer. The tool's cutting-edge must be in full contact with the flat sawn surface of the stone in order to transfer the direct shock that fractures-off the waste. This generally means its use is limited to the early stages of working the block. One of these specialized chisels is the Tracer or Line Tracer, which looks like a very stout and oversized Flat Chisel. It is used to 'trace' a line across or around a cut block of stone to create a weakened area, allowing a controlled fracture of the block. It is repeatedly placed perpendicular to the surface of the stone along adjoining segments of the intended splitline and at each placement struck a blow with a heavy hammer. On larger stones the Tracer is sometimes used along the split line prior to drilling for Feathers and Wedges, though It is only used only on blocks with flat-sawn surfaces. A small version of the Pitching Tool that has the cutting face offset from the center axis of the shank is called a Chipper. This offset is to allow clearance when doing a 'finishing' pitch following the work of the larger Pitching Tool.